Find out how to obtain all achievements in Accounting+. You get this achievement for turning around in the tutorial. to actually score a point). In the gang level grab the brick and hold it until the 3 animals stop talking. Eventually after holding it long enough the brick will start talking to you. "its too late" when you can throw it). knife from the table and drop it down the grate in the floor. a secret coin. Keep knocking at the door and listen to all the guards dialogue. Eventually he lets you in without a coin. (This takes a long time). automatically) Then eat the gross poo to summon satan. bone xylophone level, you will be in the van level. Open the shutter to see cops pursuing you. The left gun case will open and you need to shoot all the cops until the pirate ship appears. Keep shooting it until it explodes. tuning until you get to the trophy station that talks about you earning trophies. At the end of the game (after you let the bomb explode in the forest fire level) you will be back in the office area with a whiteboard. Turn on the phone and listen to the 2 people congratulate and insult you until the very end. (Wait until they stop talking) Then keep flipping the board over and over and over until you get Reggie Watts. (A big sharpie face that starts talking to you). from the tree he will scold you for planting his seed and the seed will grow into a small flower. Now just do what you would do regularly (Play the game like normal and keep going until you get to the forest fire level) Once you get there you will notice that the flower has now turned into a tree with an apple hanging from it. Grab the apple and put it on your face to get to a secret room with a creepy accounting+ fanboy sitting in the corner. Wait until he takes off his headset and then grab it from his hand and put it on yourself. (or you can try to pry it from his face before he finishes). 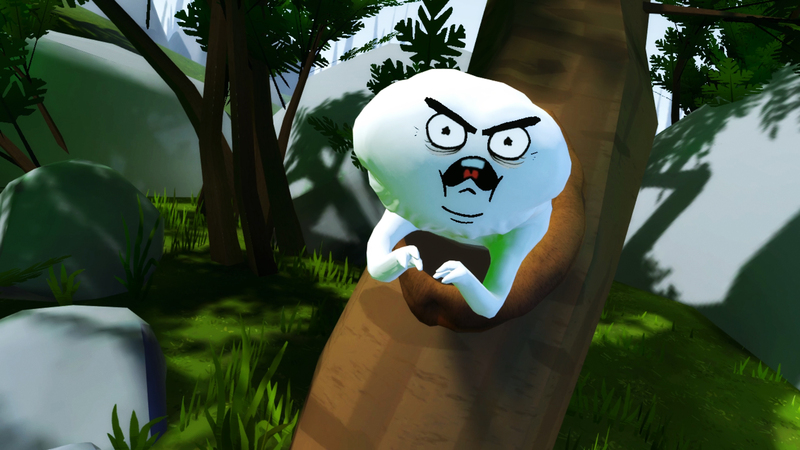 Head into the first forest level (where you first meet "f*uck you" guy) and wait until he pops out of his tree with the vr headset and the battery. Leave the vr headset where it spawns and just rotate it so the empty hole that the battery goes into faces the generator. Walk to the generator, grab the battery and throw it towards the vr headset from that distance. If you land it, you get the achievement. between you two (the playspace is small so just stand as far from him as possible while still facing him) Then throw the knife into his stomach. Head into the heart level (where the bone xylophone and the secret door are). Go towards the secret door and knock on it. After the guard stops talking go towards the big bone that houses the acid and grab the coin next to it. Now just try to throw the coin into the coin slot from a distance. (Can be done from the doors playspace). Head into the first office level (where you first meet the two phone guys) Follow their instructions until you are tasked to insert the accounting cartridge. Grab the cartridge, and try to throw it into the slot from a distance.